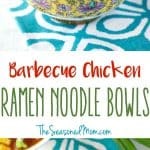 The most delicious and easy Barbecue Chicken Ramen Noodle Bowls with only 10 minutes prep time! 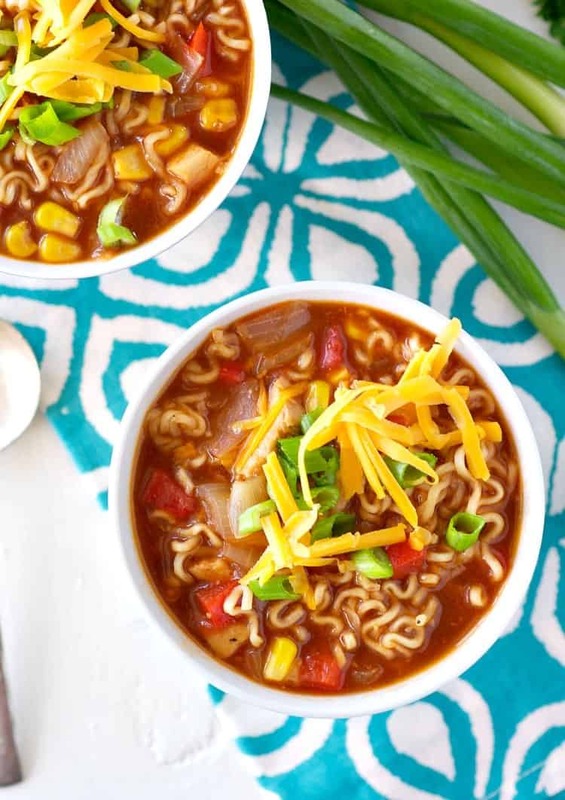 The classic dorm room favorite gets an upgrade in these Barbecue Chicken Ramen Noodles! The easy soup recipe is a healthy dinner option that only requires 10 minutes of prep! Spring is such an in-between season, isn’t it?! One minute it’s cool, windy, and rainy…and the next day it’s sunny and 70 degrees! Since we seem to flip-flop with the temps at this time of year, I thought that it would only be fitting to share an “in-between” or fusion meal, too! 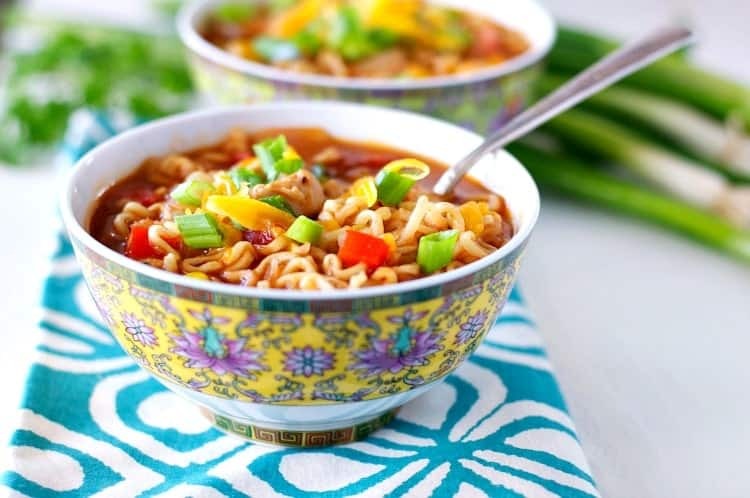 Part winter (thanks to the warm and cozy broth)…and part summer (thanks to the fresh veggies and barbecue chicken)…these Ramen Noodles are the perfect dinner to help you crossover from one season to the next! For those that aren’t familiar, ramen is a Japanese noodle dish. It consists of noodles served in a broth (usually meat or fish based) and traditionally flavored with soy sauce or miso. 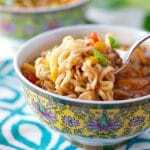 Ramen noodles are then topped with vegetables, meat or even egg. 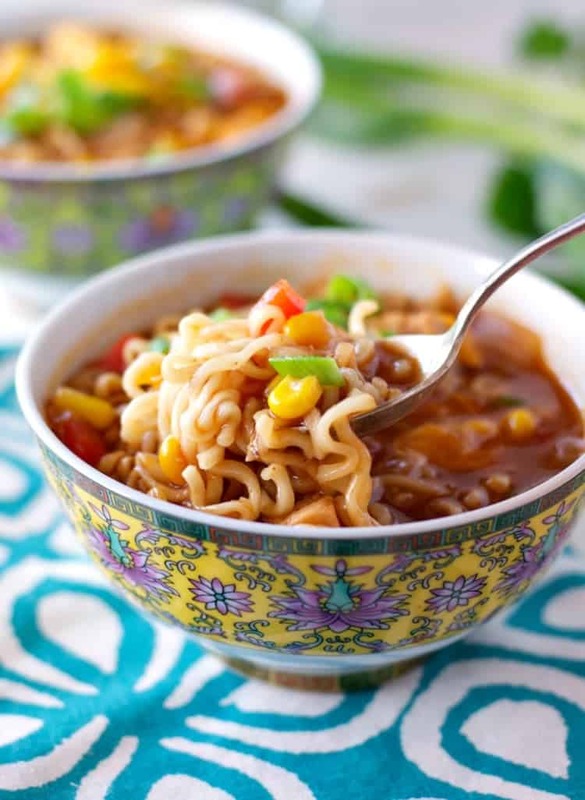 While the recipe calls for those old-school super-cheap cups of ramen noodles that every college kid loves, the noodles are the only ingredient that you’ll actually use from the package. Don’t worry — no sodium-laden flavor packets necessary for this meal! BUT, similar to the college student staple, this dinner is FAST. Maybe not 1-minute-microwave-fast, but pretty darn close. You only need about 10 minutes to prep the soup and your supper will be ready to serve (from start to finish) in about 30 minutes. That’s manageable even on a busy weeknight! Saute onion and bell pepper in oil and cook until softened. Add garlic and cook for 1 minute. Stir in corn, tomatoes, chicken, broth, and barbecue sauce. Bring to a boil, then reduce heat and simmer. Add ramen noodles and let sit until softened. Serve in a large bowl topped with green onions and shredded cheese. In a large, heavy-bottomed pot, saute onion and bell pepper in oil and cook until softened, about 5 minutes. Add garlic and cook for 1 minute. Stir in corn, tomatoes, chicken, broth, and barbecue sauce. Bring to a boil, then reduce heat and simmer for about 10 minutes. Add ramen noodles and let sit for 3-5 minutes until softened. Spring is definitely such strange weather! It’s been in the upper 50s and sometimes 60s here lately, and this weekend its back down to the 30s and 40s. This noodle bowl sounds like the perfect way to warm up! I love the barbecue flavor, Blair! So creative and sounds so good! Thanks, Gayle! I know — it’s so odd! We had 80 degree weather on Wednesday, and snow in the forecast for Sunday. Boo!!! Oh how fun is this dish, Blair. If only I had this recipe when I was in school I would have avoided so much of the junk food! This is so yummy looking and kids are going to gobble it up and be asking for seconds. Just loving it!! Thanks, Robyn!! I know, right?! Cheapest food EVER!! 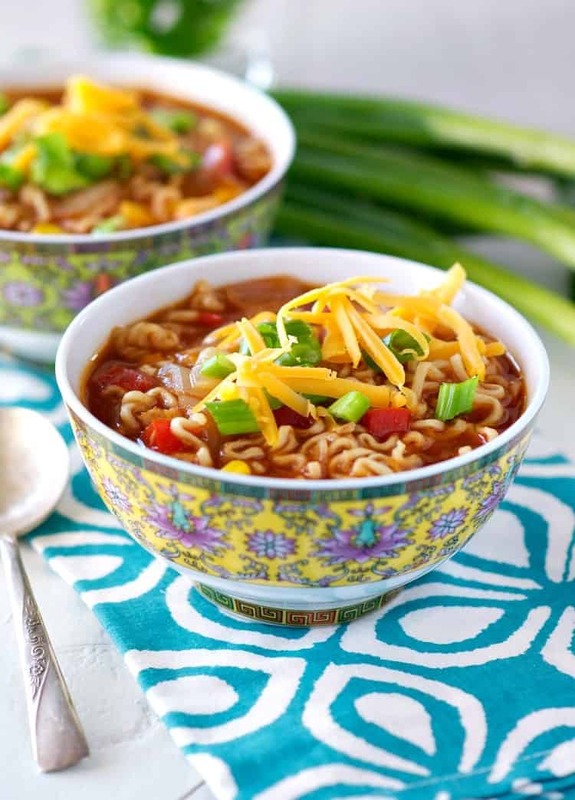 And so filling — there’s a reason the college kids love ramen noodles! Love this recipe, reminds me of younger times. We lived off ramen noodles in college, we would pool money together to buy them. In those days they were not popular and only cost $.10. Look forward to making this. Where are the kids, hope they are doing well. Receive contest package today. Thanks again for everything. Thanks, Shirley! I do think that ramen noodles are still some of the cheapest food that you can purchase at the store! There’s a reason college kids love them! I’m so glad that you received the prize package! Have a wonderful weekend, and thanks again for reading! !